We all want to be more successful, or popular, or liked, or have a greater sense of belonging. As such there is a very robust self-help industry which includes seminars, webinars, books, tapes, videos…the list is endless? Why? Because deep down, we all want to feel important, and know we cannot do that by ourselves (hum, sounds like a quotation).. Nonetheless, I have posted what is now called life hacks that have been practiced by successful people for years. A lot of them have to do with ‘body language’ and Dale Carnegie’s “How to Win Friends and Influence People.’ These small shifts in behavior or awareness will give you greater control of potentially important outcomes, from everyday situations to stressful job interviews. Of course, do not stop reading books on how to win friends and influence people, but at least this list gives you some sure fired tips to deploy now. When scheduling an interview, ask what times the employer is interviewing and try to be first or last. There was a lengthy study done about paroles in Israel, and guess what, seems that the people got paroled more often first thing in the morning and right after lunch…so, yes, fatigue plays a role too. Better to be first than last. 2. Once you make the sales pitch, don't say anything else. This works in sales, but it can also be applied in other ways. I have sold billions of dollars worth of high tech product and after I do my pitch and explain their benefits, I just shut up (actually, something that is really, really, really hard for me to do). Although this seems like a really small thing to do, actually works. Often there were long periods of awkward silence as the person tried to come up with some excuse why they did not need the product, but usually they bought and bought it at full price. 3. If you ask someone a question and they only partially answer, just wait. You have heard the expression, ‘Silence is Golden,’ well if applies here too. If you stay silent and keep eye contact they will usually continue talking. Remember, most people love to hear themselves talk, so by ALL means let them. If you are doing the talking, you are not learning anything new. 4. Chew gum when you are going into a situation that would make you nervous. We all get nervous at times, but some things like public speaking or bungee jumping or asking someone out on a date, make us REALLY nervous. Our brains are funny things. If we are eating, something in our brain reasons 'I would not be eating if I were danger. So I'm not in danger'. Though some people think it is rude to chew gum, so it anyway, but be as discrete as possible. While I tend not to have nerves, I know it has help others I know remain calm a few times. 5. People will remember not what you said but how you made them feel. This is just “How to Win Friends and Influence People” 101. Remember, people LOVE talking about themselves, so ask lots of questions about them. And remember, do not interrupt unless to add a follow up question or keep them talking. See partial answers previous. 6. When learning something new, teach a friend about it. This is a quote by Joseph Joubert, “To teach is to learn twice,” and it is true here. When you can teach it, and do it well, your understanding of it will increase rapidly and you will learn new things in doing so. 7. Be really happy and excited to see other people, they will react the same to you. Believe or not, we tend to mirror people who show either positive or negative emotions. It is comes from our innate desire to ‘belong.’ This may not always happen first time you try it with a certain individual, but it will definitely happen next time. 8. The physical effects of stress are almost identical to the physical effects of courage. There is a VERY thin line between courage and cowardess, or the desire to fight of flight. When you feeling stress from any situation immediately re-frame it: your body is getting ready to be courageous, it is NOT feeling stress. Remember, if it does not kill you, then it is just all in your mind, and it will make you stronger. 9. Pay attention to people's feet. There are a lot of books out on body language, you know folded arms, playing with hair, etc., but if you approach two people in the middle of a conversation, and they only turn their torsos and not their feet, they do not want you to join in their conversation. So do not! Similarly if you are in a conversation with an individual who you think is paying attention to you and their torso is turned towards you but their feet are facing in another direction, they want the conversation to end or at a minimum, the topic to change. 10. Fake it until you make it; confidence is more important than knowledge. OK, Einstein said imagination is more important than knowledge, and it takes some imagination to have confidence at times. Remember, no one EVER started out as an expert or a super star, but one thing every super star had before they became one is the confidence that one day they would. Of course in addition to belief and good self-talk, there is that little thing called work. Still, do not be intimidated by anyone, everyone is playing a role and wearing a mask and no one is an expert in everything. 11. If you pretend to be something for long enough, you will eventually become it. This goes with #10 above. It is NOT to say be something you are not or phony. But as Denis Waitley said “It’s not what you are that holds you back, it's what you think you're not." We are what we think, so think well of yourself. 12. Not to be creepy, but if you want to stare at someone unashamedly, look directly past them. OK, this might be one of those weird mind tricks, but sometimes some people are just too, well good looking not to stare. The trick is to stare past them until they try to get your eye contact. When they fail to do that, they will look around (usually nervously for a second) they won't look at you again for some time. This is your chance to straight up stare at this person for at least 45 seconds. Do not try this very often, as you might get “that creepy guy” reputation. OK, everyone stays build a network. That is NOT just going to Meetups and handing out a bunch of business cards. It is about becoming a source of information, and letting others be yours. Even grabbing a cup of coffee, or a glass of wine, or attending a informal event with a former colleague or distant friend once a year will keep you in the loop at the old office or gang. Old friends and former coworkers might have gotten a new position in that office you always wanted to work in or do business with, great! It’s time to get together again, so offer something in a non-business environment. It's all about connections and information. Pretend it is your grandmother or your best friend; it will significantly reduce your road rage. As I like to say, “Who angers you masters you.” And who wants to be owned? And really, is ANYTHING so important that you cannot give up a few minutes. Hum, those Catholic School nuns actually got this one straight, and lucky for me I went to a boarding military school. Why do we respect those in the military so much? They show command and it has everything to do with posture (ok, and the uniforms too). No slouching, hands out of pockets, and head held up high. This is not just a cliché. You literally feel better and people around you feel more confident in you. Be large and in charge. 16. Avoid saying "I think," and "I believe" unless absolutely necessary. 17. When feeling anxious, clean up your home or work space. Time never passes so slowly as when you are anxious, and as Seth Godin says, “Anxiety is nothing but repeatedly re-experiencing failure in the future.” One sure way to make time move faster is to do something that takes your mind off the subject. If you do not want to clean up, and have the time, go out and play tennis, golf, or basketball instead. You will feel happier and more accomplished than before. 18. Always buy the first pitcher or round of drinks. There are two reasons to do this. First, everyone will remember you bought the first round (because they are still sober), and you will surprised how long you can drink on the phrase "I bought the first one." 19. Going into an interview... be interested in your interviewers. Again, when you really want to make a good impression, do NOT focus on yourself. If you focus on learning about the OTHER person you seem more interesting and dynamic. (Again, people love to talk about themselves.) And when the other person has exhausted their self adulation, they might ask you about yourself. Make it brief. 20. Pay Attention Parents: Always give your kid a choice that makes them think they are in control. It is always about teaching and empowering kids about making decisions. I always used to ask my sons, “Do you want to brush your teeth, or do you want me to do them?” Notice the topic of getter you teeth brush was NOT up for debate, just the choice of whom was going to do it. Today, I hear it back from them when they ask me, do you want to eat at X or Y? Pro-tip: In most cases, this works on adults. 21. Your actions affect your attitudes more than your attitudes affect your actions. The attitude you bring with you when do something more often is much more important than how well you do something. "Ability is what you're capable of doing. Motivation determines what you do. Attitude determines how well you do it," as Lou Holtz once stated. So, you can jump and dance FOR joy, or you can also jump and dance joyfully." 22. 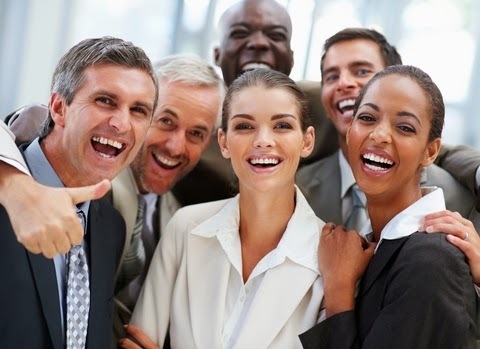 When a group of people laugh, people will instinctively look at the person they feel closest to. Remember, we are pack animals at heart, and instinctively we want to be accepted, and when we laugh, our masks are taken off. So, naturally we look out closest ally in the ‘pack’ for approval. So, if you want to impress a certain person, look at who THEY are trying to impress or feel comfortable with, and make sure you get to know them too. Put a mirror behind you at the counter. People have no clue what they look like when they are angry, and this is a great way angry customers who approach you will have to see themselves. An believe me, it is NOT a pretty sight, and most people want to look good. Chances are once they see themselves, their incidence of behaving irrationally lowers significantly. This also works is your significant other is upset with you as well. When I was married, every time my wife was angry at me, I would go into the bathroom and stand with my back to the giant mirror. Within 30 seconds she would stop yelling and leave the room. She was still angry, but she could no longer vent as long as she had to look at herself doing it. 24. If you want to build rapport or gain trust quickly, match body posture and position. Yes, I mentioned ‘mirroring’ earlier, and if someone is sitting with her legs crossed, cross your legs. If they are leaning away from you, lean away from them. If they are leaning towards you, lean towards them. Mirroring and matching body position is a subconscious way to tell if someone trusts you or is comfortable with you, or is in ‘sync’ with you. If you are sitting with your arms crossed and you notice someone else is sitting with her arms crossed, that is a good indicator that you have/are successfully built/building rapport with that person. Better yet, when they stop mirroring you, and then move into your “close circle” of intimate space. This is especially nice if it is a beautiful girl. I am sure I missed some things. Let me know what life hacks you would recommend in the comments and I'll be sure to add them. Thanks for reading and sharing and commenting!